You've heard it time and time again, 'Leverage your business on social media.' But are you? Most of the time, B2C brands get all the attention on social media, but B2B social media use may surprise you. It's easy to fall into the perception that B2B marketing is boring and unfit for social media and, ultimately, many B2B brand gets overlooked (or under looked). But this is wrong! GE has been dubbed the 'most exciting boring brand' due to their social media efforts. 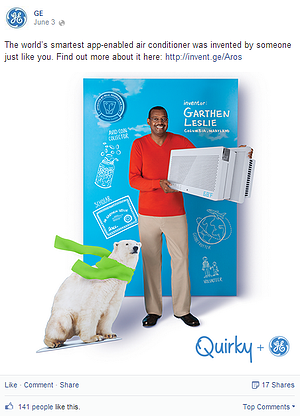 My personal favorite B2B brand, GE has created a playful, educational and informative persona on social media. Focused on brand awareness and community engagement, GE is a social media success story for the books. Facebook Tagline: We love science, technology innovation and hearing from you! So, say hello. Mission: "This page is meant to provide a positive, engaging community where forward-thinking individuals can join the conversation around innovation in energy, health, transportation and infrastructure, as well as GE and its products." Strategy: By using a mix of questions, images, videos and links - GE creates posts that relate to a wide range of topics including jet engines, medical science, outer space and data science. While there is frequent mention of the GE brand, the posts are less on the company and its products and more on technology and innovation. Campaign(s): GE is constantly implementing interesting and engaging social media campaigns specific to the platform used. 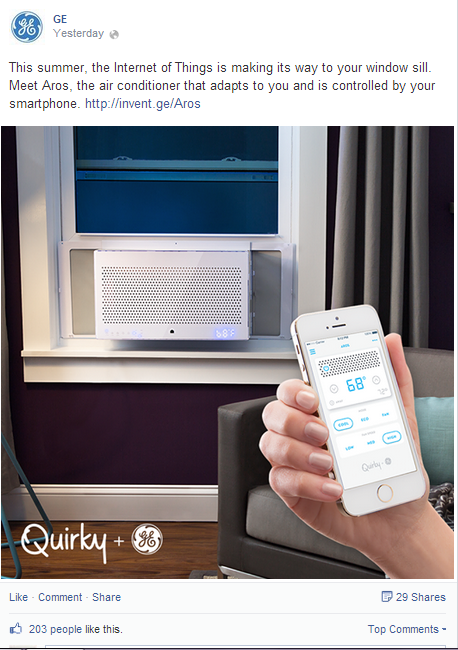 Most recently they've rolled out a Quirky+GE campaign to advertise the newest edition to their appliance family, Aros, "the world's smartest air conditioner you can control with your smartphone." Through video marketing, custom graphics, photographs and more, GE is not only using their social media platforms to market their product but to educate their communities on Quirky, the IoT, inspire innovation and inhibit conversation. "GE works on things that matter. The best people and the best technologies taking on the toughest challenges. Finding solutions in energy, health and home, transportation and finance. Building, powering, moving and curing the world. Not just imagining. Doing. GE works." Why They Work: GE's social media campaigns are always successful because they go beyond the company and the products and straight to their customers and audiences. Overall, the range of content is very creative; turning what could be dull content into interactive and engaging images and videos. They also pose lots of questions to get their audience conversing and sharing ideas. 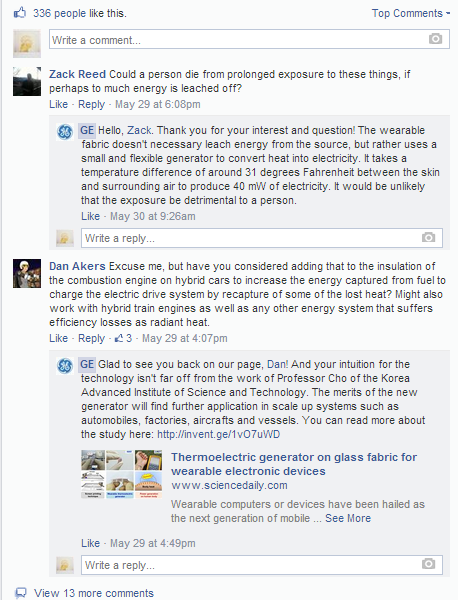 While GE receives exponential engagement, they do their best to respond to questions, comments and complaints. All-in-all, GE's overall social strategy along with their many small (and large) campaigns have fostered a huge community of forward-thinking and innovative individuals while truly transforming GE into a human brand. American Express OPEN is the B2B sector of American Express, which provides different types of business credit cards for companies of all shapes and sizes. According to Fast Company, OPEN Forum is AmEx's "latest and greatest example of a loyalty service, a program designed to help small business owners grow their businesses by providing both insights and resources online." They created a website solely for OPEN Forum and dedicated multiple social media platforms to share and discuss insights as well as engage with business owners on how to be successful. Tagline: Helping businesses do more business. Mission: "American Express OPEN is where you can discover insights, make connections and get exposure to help you grow your business. Tap into the collective ingenuity of other business owners as they discuss and share ways of doing business." Strategy: With nearly 60% of small business failing within the first year, AMEX's main strategy is to help more business stay in business. Focusing greatly on insights and tips, AMEX creates OPEN Forum posts that equip small business owners with the skills and knowledge they need to succeed. By incorporating questions, images, photographs, links, quizzes and more into their content they foster community and support. Similar to GE, OPEN Forum is less about AMEX and more about their customers. Campaign: OPEN Forum is more or less a campaign under American Express dedicated to small business owners. Aside from social media, their unique website is frequently updated with new content, including blog posts and videos. The shining star is their "Idea Hub" which is a forum that allows members to network and share ideas with each other and industry experts. On their social media, tips and tricks to building, sustaining and growing your business are the bulk of posted content. AMEX OPEN Forum is truly dedicated to helping businesses do business. Specifically, in 2011 AMEX OPEN launched "Big Break for Small Business", an annual US-based contest enabling small businesses to better connect and engage with their online audiences. In the second year of the contest, the winning businesses received extensive marketing and strategy sessions from Facebook and AMEX industry leaders, along with the money to make what they had learned a reality. One business who won the contest cited a 30% boost to their sales as a result of the contest. Why It Works:The main reason why AMEX's OPEN Forum campaign works is because it doesn't try selling credit cards to small businesses but rather instills knowledge and delights customers. They're also constantly answering questions through created content and always link their posts back to their own website. Along with the use of images, AMEX continues to build a community of growing businesses and helps to keep them in business not only with their credit card service but also with all the insights, tips and information needed to keep them afloat. Maersk Lineis a container shipping giant with operations in more than 100 countries and well-known within the shipping, energy and maritime technology industries. In 2012, Maersk competed alongside 500 other B2B and B2C to win the Social Media Campaign of the Year and Community Presence Award at the European Digital Communication Awards. Their social accounts include: Facebook, Twitter, Vine, Google+, Instagram, Pinterest, LinkedIn, Flickr, Tumblr and a blog. Tagline: "Maersk Line is the world's largest container shipping company. We're known for our reliable, flexible and eco-efficient services." "Social media is about communication, not marketing. It's about engaging, not pushing. And social media is definitely not just about the media side. For a company like ours social media creates more value when it challenges the way we think and interact. In fact, social media is a mindset, a way of thinking and working together. It's based on the fact that we are social animals, and that means we can only benefit from sharing our thoughts and ideas with each other." Strategy: Maersk utilizes almost every single social media tool available and has a significant presence across social media platforms. 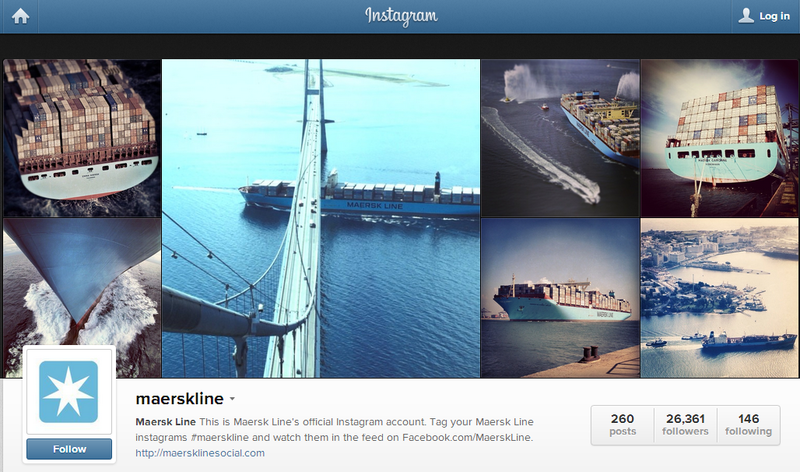 From time-lapse videos on Vimeo to intriguing photos on Instagram, Maersk has fully embraced traditional B2C platforms. The initial mission to communicate and interact with their audience instead of driving new leads has always been their driving force. Their Twitter account is managed by a panel of employees, including a captain, a graduate program student and Maersk directors. With this, they hope to create transparency and bring their employees' expertise and diversity into play. Campaign: Each platform is ideally a different campaign. With Twitter, it's become an integral part of their media relations strategy. On LinkedIn, they use the platform to have a "serious professional forum" where they can connect with customers. Maersk also utilizes LinkedIn to have conversations with shipping experts on issues such as piracy and trends affecting the container industry. With Instagram and Pinterest they run a continuous campaign of user-generated content of "container spotters"; followers take pictures of containers and upload them to the platforms. Many of their topic-specific campaigns revolve around current events. One example is how the company handles massive weather events such as "Hurricane" Sandy, the super storm. They even take the time to create campaigns revolving around "bad" press. One of their ships had unintentionally hit and killed a whale, so they decided to come out and address the incident. A description of the event was posted on Facebook and they also created a Pinterest board in memorandum of the whale. Why It Works: The main reason Maersk's social media strategy works is because they don't look at social media as a way to garner more sales, but to reach out to their employees and their customers. By incorporating engaging content such as questions, photographs, links and more they are fostering conversation rather than advocating their product and service. Maersk also spent a great deal of time listening to the social media scene and researching and understanding the value, benefit and role of social media for a B2B company. By approaching it differently that other B2Bs and investing the time and effort needed, Maersk has revolutionized social media. But keep in mind, it's not about B2B or B2C, but rather H2H, human-to-human, marketing. At the end of the day, whether your products or services are used by individuals or businesses, you're still selling to people.